Hi, Delilah. I’m happy to be with you today as we ease (hopefully) into fall. Well, if I ever doubted Climate Change and Global Warming, which I never did, this summer proved that our Earth is going through some troubling times. The Rim of Fire in the Pacific is working overtime. The glaciers are melting at a shocking pace giving us an actual Northwest Passage. The super volcano at Yellowstone is starting to worry me. And here in Maine we had the summer from hell. It started slow with a snowstorm in mid-April (the morning of my birthday on the 20th actually, what a birthday present), cold weather for our annual International Marathon in late June, and then finally in July the 80 degree temps set in and lasted for two months. Normally we get a couple of days of 80 degrees in late August early September, but this year was a scorcher. It was made worse by the fact that most homes and business in Downeast Maine don’t have air-conditioning. In fact, last night I was considering going out to my car and turning on the A/C and sleeping in the back seat! I was so looking forward to a bumper crop of raspberries and blackberries. Spring was glorious with their blossoms. But it was so hot that most of the berries scorched on the vine. Just shriveled up like raisins. The heat has been especially bad on our wildlife. I’ve seen no deer or moose, just some signs of coyotes and a bunny that has stayed with us visiting every morning and evening when the temps are a little cooler. I haven’t seen a single hummingbird and normally they are numerous. 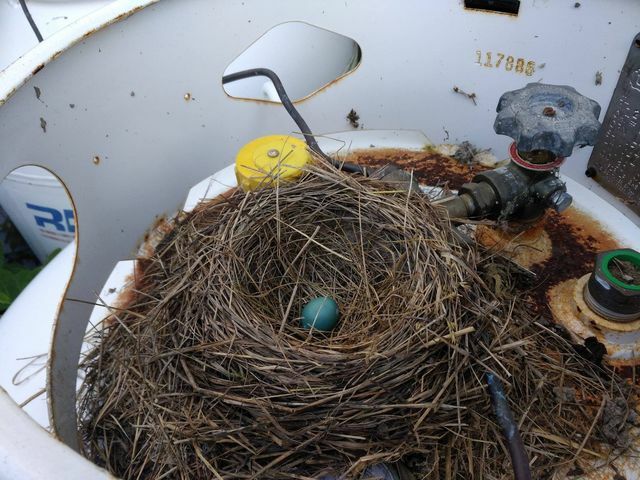 But a bird built a nest in the top of my propane tank and laid some eggs. One is still there, unhatched. I think it got too hot before the poor thing was ready. But some good things came out of this strange weather. My yard turned into crispy weeds instead of lush rye grass, so a saving on my landscaping expenses. The bugs were scarce until just the last week or so because we had an almost rain-free season. Then last week the mosquitoes, and we have huge ones up here, realized that if they didn’t get busy and start biting, their summer would be wasted. Now the weather is turning. Today the high is 63 degrees and I saw a flock of Canadian Geese beginning their yearly migration south this morning. And with the cooler temperatures, all my apples (I have many trees, wild ones) will be ripening. I’m madly searching for a recipe for crabapple jelly now. And I have several trees near my house with apples the size of cranberries. I wonder how I prepare those? However, now that it’s autumn (almost) I’m anticipating my most productive time of the year. 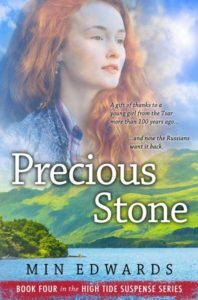 I’ve just received the edits from my editor for my next book, The Russian Phoenix, the prequel to the last book in my High Tide Suspense series, Precious Stone. It’s what I call a fictional memoir—the story of a young Russian girl, her turbulent life in the 20th century including the Romanov Jubilee year of 1913, and her life adapting to the changes that threaten to overcome her during the rest of the century. It will be published in just a few weeks. I’ve also started research on my next series, Wolf Moon. I’m very excited about that. I get to use my bachelor’s degree in anthropology! The first book, and I don’t have a title yet, is about a Shoshone girl, Glory, from the Wind River Reservation in Wyoming. 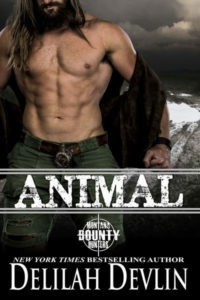 The series begins in 1949 and each of the books in the series uses as the protagonist, one of the sons-daughters on the family tree of Glory Grey Wolf. There’s some mysticism, some politics, some adventure! Visit my Facebook page, www.facebook.com/AuthorMinEdwards where I’ll keep you up-to-date with my progress. Collee McCullough, the owner of The Bakery in Stone Bay, Maine, has a perfect life until early one morning men in suits come calling. She has something someone dangerous wants. Something that her Russian great-grandmother Natasha took when she fled Russia in 1913. Too bad great-gran never told her family what she had or where she left it. Jake Elsmore, visiting Stone Bay to sell his mother’s house, walks into The Bakery for a cup of Earl Grey tea, but gets more. There she is. A sprite in a flour-dusted apron, stepping out from behind a big burly policeman; a lovely, fiery-haired fairy toting a shotgun while two men are laying insensate on the floor of her shop. Looks like that tea will have to wait. 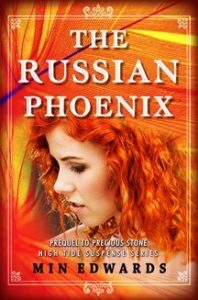 Natasha, a young cousin of Alexandra Feodorovna Romanova, the Empress Consort of all the Russias, is eighteen and living a life she never dreamed. The year is 1913, the 300th Jubilee Year of the Romanov rule and it has been filled with fêtes, balls, and excitement. But the night of the last ball of the season a burgeoning love affair goes horribly wrong and she’s kidnapped and whisked out of Russia. Her adventures change her life in ways she could never imagine and take her far from home. But her travails forge her into a strong, resourceful woman of the new century. Look for this, coming soon! Min Edwards is the pen name of archaeologist, former bookstore owner, and eBook designer (A Thirsty Mind Book Design), Pam Headrick. She is a life-long Texas girl who on a whim decided to leave the heat of Central Texas and move to her property on the coast of Maine. What was she thinking? Now Lubec, the most eastern town in the USA is her home. She writes from a desk near her kitchen window in an almost 200-year-old farmhouse overlooking apple trees, mating pheasants, rabbits which turn from brown to white in the winter, and the occasional moose. Just down the road is her private beach which is unfortunately not sand but shingle… small stones which have been tumbled by the surf for eons. And they sing when the 30-foot tides of the area wash over them. 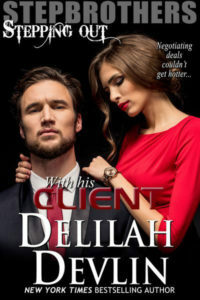 Her muse and constant companion is Zach, a 12-year-old black German Shepherd who offers comedic relief when she needs it… like when one of her characters is not following orders or a plot has imploded and it looks like it’s time to start over.